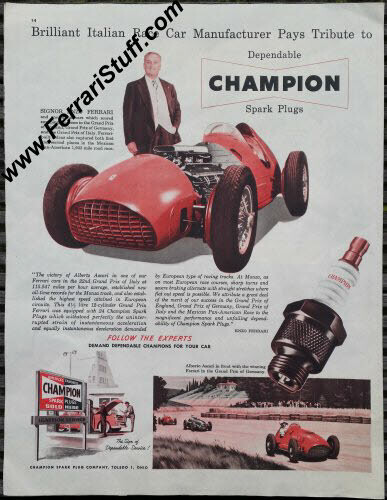 Vintage 1952 Enzo Ferrari Champion Spark Plugs ad with Alberto Ascari. 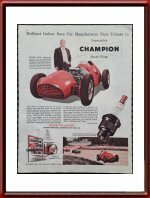 This is a vintage 1952 Champion Spark Plugs advertisement, showing a proud and youthful Enzo Ferrari next to the Ferrari 500 Formula 1 car with which Alberto Ascari had just won the 1952 Grand Prix at the Nurburgring. The caption reads "Brilliant Italian Race Car Manufacturer Pays Tribute to Dependable Champion Spark Plugs". It measures approximately 10.4 x 13.6 inches or 26.5 x 34.5 cm.